Be the first to share your favorite memory, photo or story of Mary Jane "Winkie". This memorial page is dedicated for family, friends and future generations to celebrate the life of their loved one. 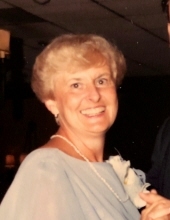 Mary Jane Elizabeth “Winkie” Dooley Lasak, 86, of Coatesville died Tuesday, March 19, 2019 at Brandywine Hospital. Born in West Chester, she was the daughter of the late Joseph and Mary Butler Dooley and the wife of Frank Lasak, Sr. with whom she shared 64 years of marriage. Winkie was a member of St. Joseph Church, Coatesville. She retired from Citadel Credit Union after many years as a Loan Officer. In addition to her husband, Frank, Winkie is survived by her daughter, Ann McNeilly and her husband Daniel of Middletown, NY and her son, Stephen Lasak and his wife Sarah of Glenmoore; daughter-in-law, Jan Lasak of Cochranville; 7 grandchildren: Sarah, Jennie, Catherine, Jack, Mark, Jane, and Charlotte; and one great-grandson, Andrew. In addition to her parents, she was predeceased by her son, Frank Lasak, Jr. and sister, Ann Marie “Nancy” Ellis. Winkie’s funeral mass will be celebrated Friday, March 22, 2019 at 11am at St. Joseph Church, Coatesville. Visitation will be held from 10-10:45am at church. Memorials in Winkie’s honor may be made to St. Joseph Church 404 Charles Street, Coatesville, PA 19320. To send flowers or a remembrance gift to the family of Mary Jane "Winkie" Elizabeth Lasak, please visit our Tribute Store. "Email Address" would like to share the life celebration of Mary Jane "Winkie" Elizabeth Lasak. Click on the "link" to go to share a favorite memory or leave a condolence message for the family. memory of Mary Jane "Winkie"